Troi proved herself to be an important asset to the crew of the Enterprise-D during the ship's first mission to Farpoint Station in 2364. Her ability to sense feelings and emotions yielded vital clues which allowed the crew to determine that the station was actually a shapeshifting spaceborne entity being forced into servitude by the Bandi. By rescuing the creature and reuniting it with its mate, Troi and her shipmates managed to pass a test of Humanity's intentions imposed on them by Q. Soon after, Troi was affected by polywater intoxication that caused her and the majority of the Enterprise's crew to act out of character, but she was quickly taken to sickbay and provided with medical treatment. Her empathic abilities were also useful a short time later, when she assisted in uncovering the intentions of Ligonian leader Lutan after he kidnapped security chief Natasha Yar. Later that year, the Enterprise traveled to Haven, a legendarily beautiful planet near Beta Cassius. The planet was also the location of Wyatt Miller, who was scheduled to marry Troi as a result of their genetic bonding. Having expected that the marriage would not take place due to the years-long distance from her homeworld that serving aboard the Enterprise would cause, Deanna initially did not inform her crewmates of her obligation. Nevertheless, she agreed to honor her vows taken years earlier, even though she had since become doubtful of them and would need to leave the ship with her new husband once they had been married. While Deanna's mother, Lwaxana, and both Wyatt Miller's parents were aboard the Enterprise, a social gathering known as a pre-joining announcement was held to celebrate the forthcoming wedding. The marriage itself was permanently canceled, however, when Wyatt, a doctor by profession, chose to join his fantasy lover (a real woman he had had frequent dreams about) aboard an infected Tarellian vessel. When a planet in the Delphi Ardu system drained the Enterprise of its power, Troi and the majority of the ship's crew suffered from exposure to extreme cold and were forced to endure almost deadly oxygen deprivation. Upon first contact with the Ferengi species in 2364, Troi reported that she could discern neither thoughts nor emotions from them, giving her the initial impression that they could shield those from others. She later mentioned, however, that she could sense one of the Ferengi was hiding something. Troi was unable to detect any feelings from the Traveler when he was encountered by the Enterprise's crew in the same year. However, she was later instrumental in discovering that an alien force had been invading the minds of crewmembers aboard the Enterprise and was influencing Captain Picard, who later temporarily blinded Troi while he was under the alien's influence. After Picard beamed himself and the alien into space, the crew believed that he could not be recovered, but Troi sensed that the captain had separated from the alien influence. Thanks to her advice, Picard was ultimately returned safely to the ship. While searching for survivors from the doomed Federation freighter Odin, the Enterprise journeyed to the planet Angel I, becoming the first Federation vessel to visit the planet in sixty-two years. As Angel I was home to a female-dominated society, Troi, who commented early in the visit that a description of the planet made her suspect the location would be very much like her own homeworld, gratefully accepted the offer to make initial contact with Angels I's inhabitants and managed to arrange a meeting with a reticent head of the planet's government. Later that year, Troi was returning from a conference when her shuttle suffered a sudden instrument malfunction and subsequently crashed on Vagra II. There, a lonely but sadistic entity that referred to itself as Armus held Troi prisoner by surrounding her shuttle with a force field and prevented her crewmates from rescuing her. Troi and her shuttle pilot, Lieutenant Ben Prieto, were eventually rescued after Wesley Crusher and Worf discovered that the field weakened when Armus was provoked, due in part to Troi's intelligence regarding Armus' emotional state and psychology. Near the end of her first year aboard the Enterprise, Troi was looking forward to a moonlight swim on the ship's oceanic destination of Pacifica, an experience she believed could not adequately be replicated by the ship's holodeck. She did not get the opportunity to enjoy her swim, however, as the Enterprise was diverted to Dytallix B and then to Earth. Deanna later helped Clare Raymond, a recently revived Human from the late 20th century, learn about her descendants and locate distant relation Thomas Raymond. In early 2365, Troi became pregnant by an alien who wished to experience Human feelings and relationships. He grew at an accelerated rate and within hours was an eight-year-old boy. At the same time, a plasmic plague struck the ship and threatened to kill everyone within hours. The alien realized that he was the source of the plague and sacrificed his Human life to save the ship, reverting to his alien form and then leaving the craft. Troi experienced both the joy of childbirth and the heartbreak of losing a child. The next year, Troi fell for a delegate, Devinoni Ral, at a conference for the rights to a wormhole. Troi and Ral had an instant attraction to each other. She learned that he was part Betazoid and had been using his mental powers to influence the negotiations. When the Ferengi threatened to blow up the wormhole, stating that there was a secret deal between the Federation and the Barzan, Troi suspected that this was staged by Ral to acquire the rights to the wormhole. The Barzan gave the rights to Ral, but it was soon discovered that the wormhole was unstable and worthless. Ral quickly left and bade goodbye to Troi. Troi thereafter met her former patient Tam Elbrun again, when he was being transported by the Enterprise on an ultimately successful mission in which Elbrun made first contact with and subsequently remained with an alien lifeform that looked like an organic spaceship and was called "Tin Man." Troi became the object of affection for a new crewmember named Reginald Barclay. He was too shy to approach her, so he created a holoprogram to interact with her. Troi counseled him, and he eventually ended the program. While attending a trade conference on Betazed, Deanna, along with Lwaxana and Riker, were captured by the Ferengi, who wanted to use Lwaxana's telepathic abilities to give them an advantage in negotiations. They used mind probes on Deanna and Lwaxana, but Riker was able to send a message to the Enterprise, communicating the location of the Ferengi ship, and they were then rescued. Troi temporarily lost her powers when she came in contact with two-dimensional lifeforms that had caught the Enterprise in their magnetic force. They were heading for a cosmic string which would destroy the Enterprise. Picard asked her to use her Human abilities to try to determine the aliens' intentions – as he pointed out, her degrees in psychology were not tied to her powers and she was still the most qualified person on the ship for the task. Troi determined that the cosmic string was their home; the Enterprise was able to break free, and after the aliens left, her powers returned. While investigating the USS Brattain, which had become stranded in space, the Enterprise found one crewmember alive, a Betazoid science adviser. The rest of the crew had killed each other. The Enterprise crew discovered that the ship was caught in Tyken's Rift, which sapped all the energy from the ship. Additionally, the crew of the Brattain had succumbed to madness through sleep deprivation from an unknown cause. The same thing was happening to the Enterprise. The crew was on the verge of madness, and only Data and Troi were unaffected, as Data did not require sleep and Troi's partially Betazoid physiology processed dreams at a different frequency. Data believed that an explosion would get them out of the rift, but the plan failed. Troi had experienced a single, recurring nightmare, but determined that it was an act of communication from other beings stuck on the other side of the rift. This communication had caused the dream states of the rest of the crew to become disrupted. In a dream state, she relayed a plan of cooperation that would release each ship. Her plan worked. Troi took command of the Enterprise after it was hit by a quantum filament that caused major damage and trapped the officers in various parts of the ship. She decided not to separate bridge and engineering, and to divert power to engineering, a decision that ended up saving the ship. Troi counseled Worf and Alexander Rozhenko, who had boarded the ship to stay with his father. Her efforts helped stabilize their relationship. Whereas Worf was about to send his son to a Klingon school, Troi observed that the boy was difficult because of the death of his mother, leaving him with a feeling of abandonment, and that sending him away would only make the boy worse. During a visit by telepathic aliens, Troi was attacked and lapsed into a coma. On waking, she believed she had been attacked by Riker. She ultimately discovered, though, that one of the aliens, who had participated in the attack, had been using his telepathic powers to make her think her attacker had been someone else than he himself. While helping to save a closed society of genetically-engineered Earth colonists, Troi became romantically involved with their leader, Aaron Conor. After the colony was saved, the romance ended as she returned to the ship and he declined to leave his colony. Troi's body was taken over by an alien spirit after the Enterprise investigated the disappearance of the USS Essex, an event that had occurred almost two hundred years previously. Troi, along with O'Brien and Data, was possessed and hijacked the Enterprise, taking hostages in the process. The Troi alien stated that he was Bryce Shumar, captain of the Essex, and that he and his crew's spirits had been caught up in the magnetic field of the moon. He asked that their bones, which were on the planet, be returned to Earth, so that their spirits could rest. Picard did not believe "Troi", and found out that she wished to return to the planet to get the other alien spirits, so they could take over the crew's bodies. The moon was actually a penal colony, and the spirits were really criminals. After Picard threatened to destroy the Enterprise and their existences, the spirits decided to stay alive on their moon. After Lwaxana boarded the Enterprise and announced that she planned to marry (again), Troi's attempts to counsel Alexander, Worf's son, about meeting his responsibilities were disrupted by her mother. Deanna also became upset that her mother was not going to follow the traditional Betazed marriage rituals. In reality, Lwaxana was suffering a mid-life crisis, and in the end, she terminated her relationship with her suitor. n 2369, Troi met Ves Alkar, a Federation mediator who routinely transferred, telepathically, his dark thoughts and emotions to other hosts, so that his mind was clear and able to mediate conflicts more effectively. After Alkar's previous receptacle expired, Troi was tricked by him into performing a "funeral meditation", which established a link – deliberate on Alkar's part – between them. 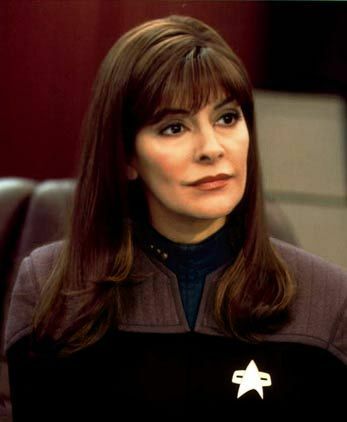 The effect of this transfer caused Troi to act aggressively and, due to the fact she was a non-Lumerian, to experience rapid aging faster than his previous victims. With Alkar refusing to release Troi, Doctor Crusher induced death-like symptoms, to trick Alkar into severing the link by trying to take another female Lumerian as his receptacle, at which point Troi was revived by Crusher and the Enterprise crew thwarted Alkar. Later in 2369, Troi was kidnapped and surgically altered by the Romulan underground movement. She was forced to assume the role of Major Rakal, an operative for the Tal Shiar, aboard the IRW Khazara. While there, Troi befriended Sub-Commander N'Vek, who helped her to adopt her role and also revealed the true nature of her mission – to help Vice-Proconsul M'ret and two of his aides defect to the Federation. Troi discovered that she wielded much power over the crew of the Khazara, as many people were frightened of the Tal Shiar. However, she had a conflicted relationship with the Khazara's commanding officer, Commander Toreth. When Troi's mission took a turn for the worse and a fight with the Enterprise seemed imminent, Deanna seized command of the Khazara. She managed to successfully complete her mission by concealing a transporter beam inside a low-level disruptor blast. N'Vek was killed by the Khazara's helmsman after Toreth retook command, and the Enterprise barely managed to beam Deanna back on board before the Khazara fled under cloak. Troi, along with Picard, Data, and Geordi La Forge, returned from a conference to find the Enterprise and a Romulan ship suspended in time, a condition caused by aliens who were using the warp core as an incubation for their young. While helping to investigate the situation, Troi demonstrated her knowledge of Romulan engineering principles, acquired during her time aboard the Khazara. She and her companions drove out the aliens, after which the timeline was restored. At the end of the year, Troi, together with Picard and La Forge, was captured and imprisoned by Lore, who planned to lead a group of individualized Borg drones to destroy the Federation and had brainwashed Data into helping him. Troi and her inmates stole a transceiver that they used to restore Data's ethics. The prisoners were finally rescued by Hugh, Data, and the Enterprise. When the Enterprise took part in a cultural exchange in early 2370, Troi served as the liaison for Loquel. She was frustrated by his behavior to the point she felt as though she was going crazy, as all he wanted to do was indulge himself and party. Eventually, she discovered his assignment was to experience pleasure. Supervised by Riker without any favoritism towards her, Troi tried to pass the Bridge Officer's Test in 2370. She attempted the engineering qualification several times without much luck, after which Riker told her the tests were canceled. However, he also gave her a hint which let her know that the test was really about her ability to send a crew member to his death. Troi went on to successfully pass the test. She was then promoted to the rank of commander and began to include bridge command as part of her duty shifts. With this development, Troi acquired Starfleet status as a line officer, in addition to her previous status as a staff officer. Troi helped save her mother's life when Lwaxana was suffering a severe mental breakdown due to a long-repressed memory. With the help of a telepathic alien, Deanna managed to enter into her mother's mind and find the source of the mental trauma. She found out she had once had an older sister who had died in a drowning accident that Lwaxana blamed herself for. Deanna was able to help Lwaxana accept the death and convince her that she was not to blame. After a crewmember, Daniel Kwan, committed suicide on board the Enterprise, Troi was asked to investigate, since the crewman had had empathic abilities and Troi might be able to find out why he had killed himself. After examining Kwan's station, Troi became insanely jealous of Worf; when she found him in the arms of another female crewmate, Troi killed Worf and attempted suicide. She was preparing to jump to her death when Worf, who was actually still alive, saved her. It turned out that everything Troi had experienced had been in her mind. When the Enterprise-D had been under construction, one of the crew, an empath, had committed murder and suicide, leaving an empathic message that had been picked up by Kwan, leading to his death. Troi had picked up the same message, but had been more fortunate. In 2371, Troi piloted the Enterprise-D during the Battle of Veridian III and when the ship's primary hull, much to her and her shipmates' distress, subsequently crash-landed on Veridian III. She was the last person to pilot the ship, as the engineering section had been destroyed, due to a warp core breach, and the saucer section could not be salvaged. In 2372, Troi transferred to the Sovereign-class USS Enterprise-E, with most of the senior staff of the Enterprise-D. She continued the occasional role of bridge command as part of her duty shifts, while posted to the Enterprise-E. In 2373, Troi and her crewmates disobeyed Starfleet orders by taking part in the Battle of Sector 001. The Enterprise was instrumental in the destruction of an invading Borg cube but pursued a remaining Borg sphere back in time to 2063, subsequently destroying the Borg craft before it could prevent the historic first flight of Zefram Cochrane's Phoenix warp ship. After the Borg attack, two teams of officers beamed to the surface of Earth, with Troi serving as a member of the second team. She searched for Zefram Cochrane on the planet and accepted a civilian's offer of a drink in return for information. After three shots of tequila, Troi, having become extremely drunk, discovered that the civilian was actually Zefram Cochrane himself. After she and the inventor were found in a bar by Riker, Troi continued to share a drink of extremely strong tequila with Cochrane, who she officially reported was "nuts", before losing consciousness due to her large consumption of alcohol. After she came to, Troi helped to convince Cochrane of the importance of his first warp flight, which he was considering canceling following the Borg attack. Troi later supervised the launch of the Phoenix from Earth, Cochrane blasting the song "Magic Carpet Ride" in her ear, a few seconds before launch. By overseeing the launch, she assisted in preserving what followed the historic flight: First Contact between Humans and Vulcans. Two years later, in 2375, Troi helped Captain Picard prepare to host a reception for a visiting delegation of Evora representatives – after having read a Starfleet report on their species – and later attended the ceremony with Picard, Riker, and Doctor Crusher. Later, Troi alone downloaded all Starfleet records on the Son'a and studied them with Riker. She was also in command of the bridge just before the Enterprise-E arrived at the Briar Patch. Upon encountering members of the Ba'ku – whom the Son'a had been observing until recently – Troi used her empathic abilities to sense that several Ba'ku children present had incredible mental discipline and clarity of perception. After it was learned that the Son'a were attempting to discreetly relocate the Ba'ku from their planet, Troi helped to evacuate the Ba'ku from their village to the safety of a mountain range. Around this time, she noticed that her breasts had started to firm up, a result of the age-decelarating properties of metaphasic radiation in the Ba'ku planet's rings. She also helped eliminate Son'a drones, but after Picard and a Ba'ku woman became trapped following a cave-in, her plan to cut away rock using her phaser was discarded, as it was thought to be too dangerous. Once the two imprisoned humanoids were released, Troi stayed with the refugees as most of the other senior officers left to successfully prevent the Son'a from relocating the Ba'ku, who were actually their own distant relations. In early 2378, Troi was serving on the Enterprise when the USS Voyager returned from the Delta Quadrant. Troi was sent to Voyager to speak to the crew as they had been through severe trauma and had not had a counselor on the ship. She worked overtime and was told by Captain Picard to treat the situation as a "catastrophic-level" duty assignment. In 2379, Deanna married Will Riker. The first ceremony was a traditional Earth wedding, where Captain Picard served as Will's best man. After that ceremony, a traditional Betazoid wedding ceremony was to take place on Betazed. However, the Enterprise-E's journey to Betazed was interrupted by the discovery of B-4 and the mission to Romulus. Troi made her final voyage aboard the Enterprise as the ship journeyed to Romulan space on a diplomatic mission in which she and her crewmates met new Reman Praetor Shinzon. Aboard the Enterprise, Troi was telepathically violated by Shinzon, who seemed obsessed by her. She used their residual link to her advantage, however, during the Battle in the Bassen Rift; after the Enterprise was nearly disabled, Troi took the helm and, under Captain Picard's orders, crashed the ship into Shinzon's Reman warbird, the Scimitar, further disabling that craft. She subsequently joined the USS Titan under Riker's command, and was due to return to Romulus on another diplomatic mission. However, the ship was sent to the Delta Quadrant instead after the disappearance of the Odyssey and Curie.